Students from abroad have approached us for advice as they plan for their higher education pathways. 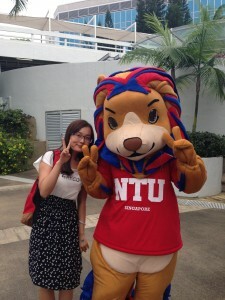 Should I study in Singapore? What do I have to do before I arrive in Singapore? What do I need to know about TUM Asia? Decisions, decisions and more decisions. To help you in your thought process, we approached some of your seniors and asked them what they did when they were in your shoes. Let Avantika, Xiaowan, Arun and Madjur tell you more about what is the most important piece of advice that they have after being at TUM Asia for a year. Q: What were some of the feelings or thoughts that ran through your mind as you prepared to take up the TUM Asia programme in Singapore? Xiaowan: I was nervous and worried. My concerns were whether I would fit into the culture and if I could keep up with the rigor of the degree programme. I was also worried if I would be homesick. Arun: I share Xiaowan’s concerns. I left behind a good job that I had in India in order to pursue my higher studies so financial stability was a big worry for me. But passion drove me on and being taught by all these fantastic professors in the programme leave me with no regrets that I made the right decision. Avantika: It was a very difficult choice for me since I had another great offer from a New York university. In fact, that university offered me a higher tuition fee waiver and research opportunities. But after weighing my options rationally, I went ahead with TUM Asia and I have no regrets with my decision. This decision was made easier with seniors who answered my queries and gave me advice along the way. Madhur: I was worried as I was skeptical regarding the reputation of TUM Asia compared to TUM Germany. But one thing kept me on the positive side of accepting this offer was the professors from Germany who fly in exclusively for lectures. And I was excited to move abroad for studies. This is how I accepted the offer. Now I can say that I am satisfied with the professors, their lectures and TUM Asia, especially that Singapore is a great place to learn about transportation as well as logistics. Q2: Having settled in Singapore for the first time, what was one memorable experience you had in the first couple of months here? Xiaowan: I learnt how to speak Singlish, which I thought helped me to assimilate into Singapore very quickly. You just need to add “Lah” to your sentences, such as “You are ok lah” or “Everything is alright lah”! Try it, you will become a Singaporean of sorts. Avantika: I came to Singapore with an introverted personality. But one thing which surprised me was the gesture of local people here. They always smile and greet people around them even though they might be strangers. This was little strange for me as prior to this I hadn’t witnessed such a goodwill gesture by strangers. 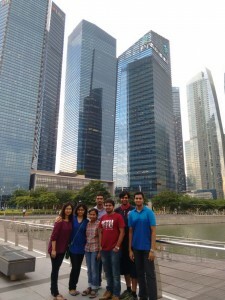 The most memorable experience within the first week of arrival was the “The Amazing Race involving Singapore tour” by TUM Asia for the post-graduate students. It was a group activity and we covered Saint Andrews Cathedral, Parliament House of Singapore, Clark Quay, Chinatown, Little India, MICA Building, UOB Plaza to name a few. Q3: Having gone through the experience of relocating to a new country and making the decision to study at TUM Asia, what would be one piece of advice you wished you had before coming to Singapore? Arun: Make sure you decide on accommodation before your course starts as you are going to stay there for at least a year. Facebook is really helpful to find one if you are a foreigner. I used Facebook to connect with alumni, to get details about the course, to confirm my accommodation and a lot more! Madhur: I would tell you to “be prepared for some exhaustive long lecture hours.” But this is mostly applicable to your first semester only. There is not much to prepare for because every student may have different observations and TUM Asia is always there to help you throughout the course in any way they can. I would rather say that get ready for the tropical-vibrant city of South-East Asia where there is a lot to learn, a lot to explore and a lot to enjoy. Avantika: This course is all about perseverance and passion. The faculty at TUM Asia (both from TUM and NTU) are top class researchers in the world and it’s a lifetime opportunity to interact with them and broaden our horizons. Moreover, it is equally important to discuss and clear the concepts with full precision. If you have your basics cleared and you are conceptually strong you will end up getting into a place you desire. In fact I am indeed blessed to have secured my internship with high speed analog circuit design research group at Fraunhofer Institute of Integrated Circuits (IIS) Erlangen, Germany and thus have made my short term dream come true. And I truly believe if I can do it without any prior semiconductor knowledge or experience, anyone can. Have you accepted your place in a TUM Asia Master programme? If you have further questions, do leave a comment in the Open House forum and a fellow student will answer it promptly!